Greetz folks. This is Igor, the Webslave of JGoth.com. Thank you everybody who have invested your valuable time to supporting and using the site – without you I would never have tried. Unfortunately due to a massive influx of spam and my own lack of time to combat that and otherwise manage the site (not to mention the decline of usage by regular members) it has been decided to retire the Jgoth.com social network. At the moment the content is hidden away from everyone while I removed some of the worst spam on the site. An announcement will be made here by February 26 when the site is accessible to the public. This will allow users/former users to access the site and download any content they may have posted there. Well, I have another site, Gothers.com, which is a much rowdier place (minus most of the spam). It is more Facebooky than JGoth (JGoth was old-skool SNS for people who didn’t like Gothers! ), and a little too bright, but I will be working in the coming months to darken the space to people’s liking. Click through to Gothers.com! JGoth.com was originally a Japanese Gothic news site, so I will be dusting off the old articles and uploading them in the weeks ahead. I got a bigger interest than JGoth itself, so I will be moving on towards more global Goth news as the site continues. I will leave moderated comments on this page and will check up regularly. Once again, THANK YOU for your time and energy and support in making JGoth.com last for a couple of years! After three years of being mothballed, I have taken steps to kick this site into gear again. Wow, there is a lot of debris that needs to be cleaned up here. I will be working to update the category system of the site so it is a little easier to navigate for visitors. This will mean that content will be jumping around a bit depending on where it is stored on the site database. Hopefully you should be able to find items that go into hiding by using the search box. The goal is to re-initiate the site so people can find more underground events in Tokyo and the rest of Japan and also to keep up with some of the bands as they work on new projects. We shall see in the days ahead. In the meantime, I have to get prepared for the Bayside+Genocide that will be happening tomorrow on October 10, 2010. 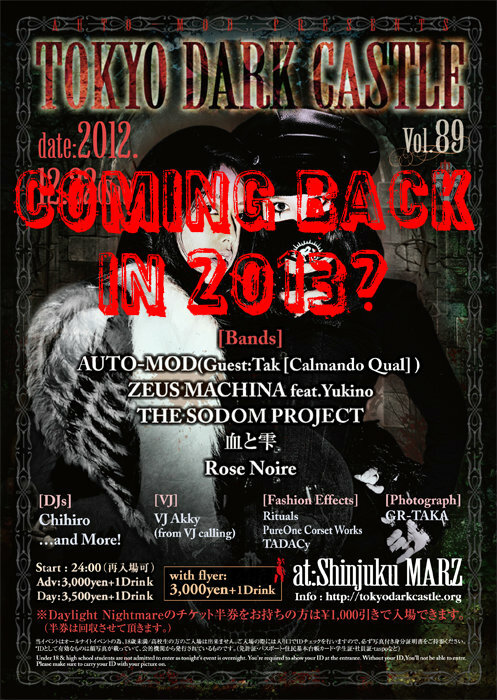 I am so looking forward to seeing my old friends U-tarou and Mikito BAAL again, and to meet new friends on the hard-core independent scene. That’s all for now – cheers. It is time for another Halloween in Osaka, and what better way to celebrate this dark night than turning up to another iteration of the famous Gothic club event, Black Veil! 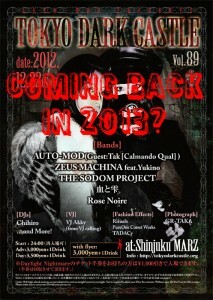 Produced by Territory-D’s Taiki, Black Veil is one of the coolest events to go to in the Osaka Goth scene. The event is an all-night affair featuring DJ’s Taiki, Bonzin and Syarman along with support from locals Moe:t and Elmina, plus a special guest performance from Nagoya’s Stigmatic DJ, Doomspider. There will also be performances from an-jali and Midori (a toast to her hallowed name!) and a shop booth for Territory-D, of course. The event is priced at 3,500 yen (plus one drink) for advanced bookings and 4,000 yen (plus one drink) on the night. I am not sure if this is dress-coded, but for any Dark Veil event it is always worth dressing up as it will be one of the best dressed events in the local calendar. Starting at 9 p.m. the event will continue on until the dawn so remember to bring a photo ID with you! Finally, after a month or so doing other things, I have come back to the blog – Tadaa! Hopefully I will have some more content up soon.